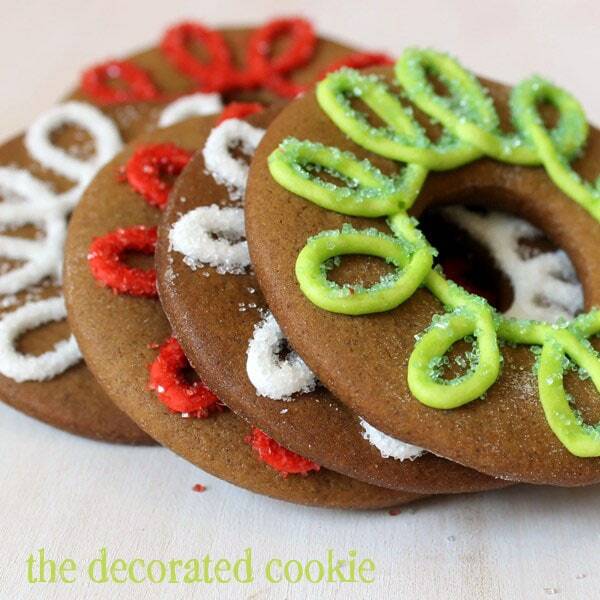 How to make simple gingerbread cookie rings for a holiday cookie treat. Last year, I brought bite-size, sparkly cranberry cookies to the now-annual I’ll Bring the Cookies event, wherein every day in December a different blogger features a sure-to-be clever and yummy cookie recipe to over at In Katrina’s Kitchen. 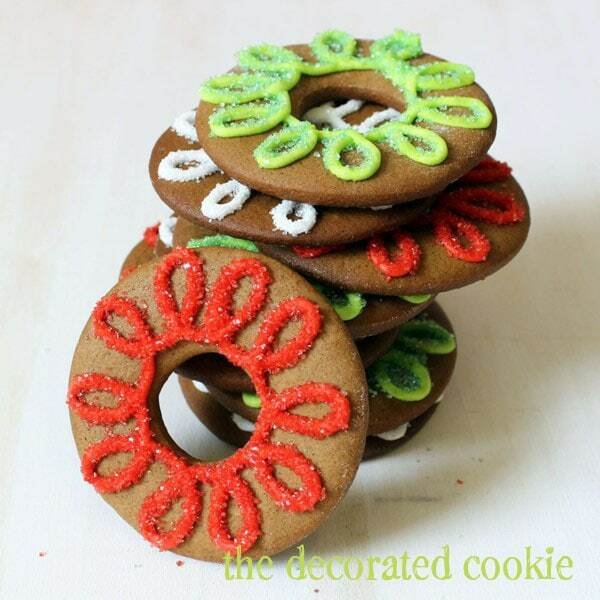 This year, I made gingerbread cookie rings. 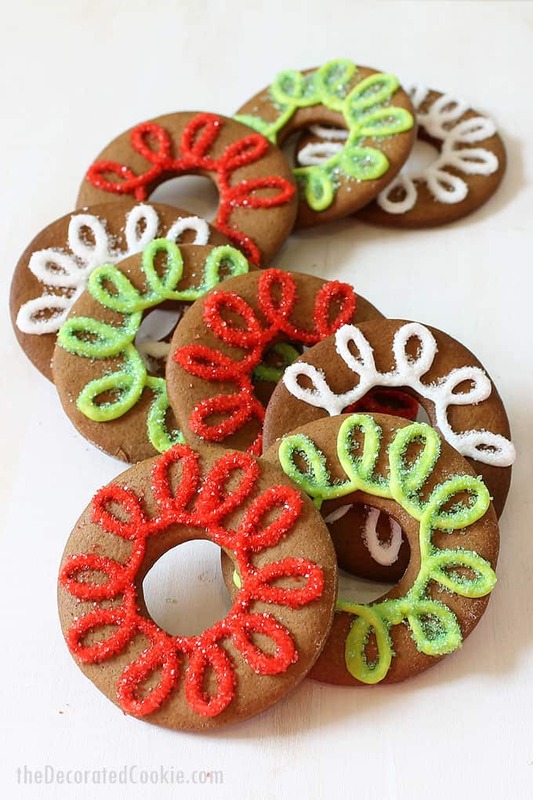 I suppose these could also be called gingerbread cookie wreaths. Is gingerbread too predictable for Christmas? Alas, I’ll say traditional, not predictable. And this gingerbread recipe is just right for cut-out cookies, making ornaments and building houses. It’s not too sweet, crunchy (so soft gingerbread lovers, be warned) and holds its shape oh so perfectly while baking. Decorate these rings, or wreaths, or ornaments, or whatever you want to call them, any way you please. I made curlycue rings with royal icing and sprinkles, but dots and stripes would be even easier. And extra bonus, she’s giving away a signed copy of Sugarlicious!! Be sure to enter over at In Katrina’s Kitchen! 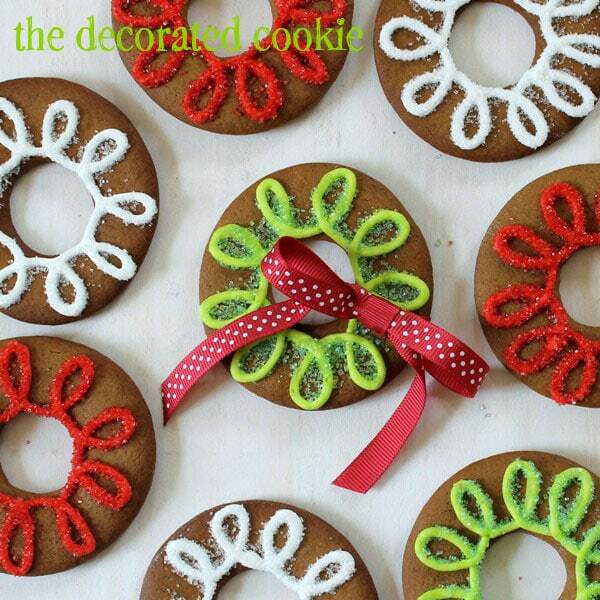 I’ll also add this gingerbread cookie recipe to my cookie and icing recipe page for Christmases to come. Try these soft gingerbread cookies, too. 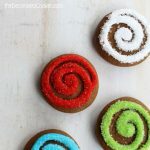 You can also make gingerbread swirl cookies. How about some bite-size gingerbread houses? I love these gingerbread whoopie pies. First, prepare gingbread cookie dough, chill it, roll it out and cut out your rings. 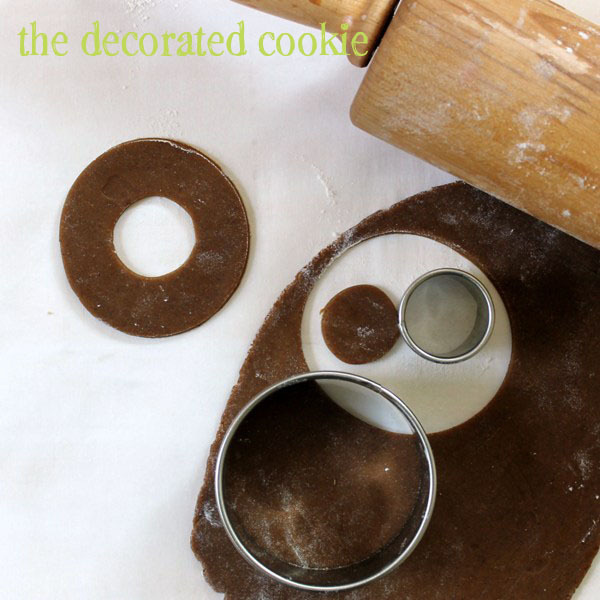 To make rings, use two different sized circle cookie cutters, sizes 3-inch and 1 1/4 –inch circles used here. Place the cookies on a baking tray lined with parchment paper. Bake in a preheated 350 degree oven for about 12 minutes, or until edges start to brown. Let cool completely before decorating. 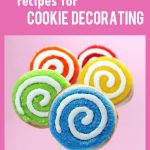 *For food coloring, I suggest Americolor Soft Gel Pastes (Bright White, Red Red and Electric Green used here), available online and in specialty stores. Find the decorating bags, couplers, tips and sprinkles in the craft store. For the decorating tips, use sizes 2, 3 or 4, depending on your design and preference. what to do: Prepare royal icing, divide and tint white, red and green. Prepare three decorating bags with couplers and tips, fill with each color, and close tightly with a rubber band. 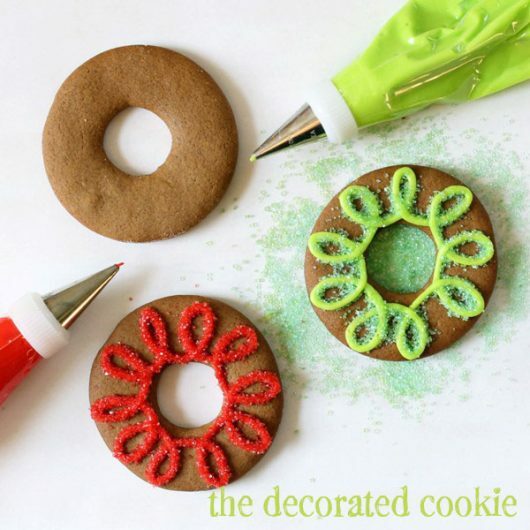 Working with one cookie at a time, pipe your design, then immediately coat with sprinkles of a coordinating color. Turn the cookie over to remove the excess sprinkles. (TIP: Sprinkle each cookie over a small bowl and funnel the excess back in the bottle.) Let the cookies dry several hours or, preferably, overnight before wrapping and packaging. 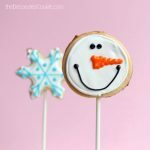 What a fun treat to bring to a party! I spent an hour yesterday looking at pictures of decorated wreath Christmas cookies! 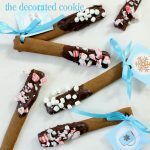 These are adorable and so simple, I love them, perfect timing!